Tired of mounting credit card and student loan debt? Do you feel like you’ll never pay off your debts with all that interest? Learn my tried and true tips on how to get out of debt faster! You open up the latest credit card statement. Every month you send in payment. And every month, the balance seems to hardly move. Frustration sets in. When I got divorced in 2015, I was left with nearly $10,000 in credit card debt. Plus student loans, a car loan, and a mortgage. These are the strategies I used to pay off my credit cards in under a year. 1. What expenses can go? When you are ready to get serious about paying off debt, think long and hard about what you really need. Ditch anything you’re not using. When was the last time you read that magazine or went to the gym? Instead of throwing money away on something you aren’t using, put those funds toward your debt repayment. 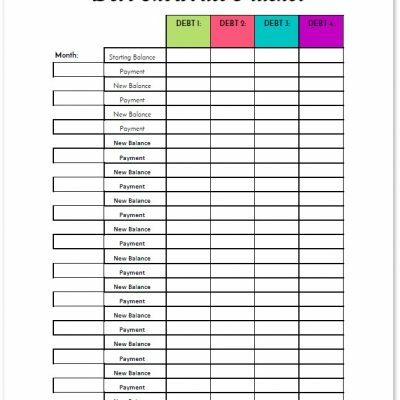 Think about your recurring monthly bills. Is there any that you can reduce or eliminate all together? For example, swapping out cable for a streaming service like Netflix or Hulu can easily add $50+ a month to your bottom line. Skip dinner out, slash your grocery bill, refrain from purchasing new clothes, or downgrade your cell phone plan. Cut any extra expense you can think of to put more money to your debts. There’s plenty of instances where we come across additional income. If you get paid weekly or every other week, there are a couple months a year you will get an extra check in a month. Many people use those big tax refund checks to splurge on a large purchase. Putting an entire extra paycheck or tax refund check towards your debt repayment makes a big dent! See if you can pick up extra hours or even overtime at work. Even a few hours here and there add up! Is there any opportunities to add commissions or bonuses above and beyond your current income? Adding a part-time job can really give you an extra income boost. If you have weekends free from your primary job, use that time to make some cash! From delivering pizzas, waiting tables, or working retail, there’s plenty of opportunities to work part-time. The holidays are a great time to find part-time retail jobs and score discounts at the same time! A side hustle is great way to continually add extra income to your budget and provides a safety net if something happened with your primary job. Start a blog, drive for Uber, get a pet sitting gig, or sell crafts on Etsy. Did you get a sizable refund last year? If so, check with your tax preparer/accountant if you can have less withheld from your paycheck. You’ll get a smaller refund next year, but you’ll be able to have a bigger budget for debt payments. When we have a large amount of debt, the total amount owed can be overwhelming. Start with the smallest debt and focus on paying that one off. When you add little extra payments to various cards, it’s easy to feel like you aren’t making any progress. But once you put all the extra money from these strategies to just one debt, you’ll start seeing that balance decrease! Instead of writing a check each month, set up an automatic payment to pay your bill. When we set up things to happen automatically, we are less likely to change them (because of the hassle). Be sure that you set up your automatic payment for an amount greater than your minimum for maximum debt repayment progress! Little changes can add up to big results when it comes to paying off your debt. Finding ways to save money plus earning extra income can bring financial freedom sooner!